The Carrolup School emerged in Western Australia as a distinctive landscape tradition of painting created by school aged Aboriginal children in the 1940s. Its elements of romantic depiction of the bush and bush life may well reflect the needs of the child artists who were removed from their Aboriginal families under government policy. 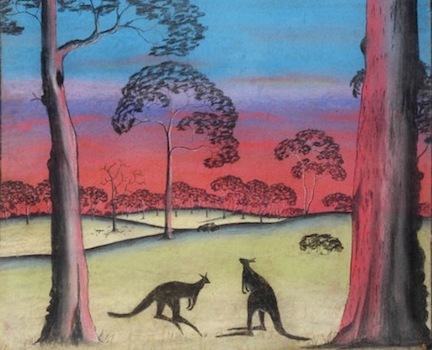 The tradition became a shared style of painting as the young artists matured and painting techniques spread through family groups, creating a regional style in the wheat belt and south west towns of Western Australia. In 2004, Australian art academic Professor Howard Morphy discovered over one hundred perfectly preserved drawings from the Carrolup River Native Settlement, boxed up and forgotten for forty years, at the Colgate University of New York. The artworks had been in storage since 1966, when they were donated to the Picker Art Gallery by US businessman Herbert Mayer. In 2013 this important Noongar collection was finally returned to Western Australia and exhibited at John Curtin University. 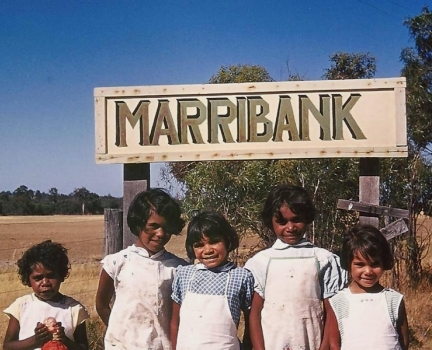 The Carrolup River Native Settlement, later called Marribank Mission, operated as part of the assimilation and child removal policy of early and mid 20th century Australia. Aboriginal and part-Aboriginal children were forcibly removed from their families and traditional lands and sent to government settlements. The conditions were harsh and the Aboriginal children were poorly treated, in what is now widely considered to be a prison-like environment. In 1945 teachers Noel and Lily White arrived at the Carrolup School, introducing an art program to try and boost the spirits of the dispossessed children. Noel White took the children out on bushwalks and told them to draw what they saw. Using the basic art supplies of brown paper and coloured pastel crayons, the Noongar children produced highly skilled, colourful landscapes and realistic depictions of traditional cultural activities from the south west. Children aged between nine and thirteen were drawing sophisticated proportionally accurate scenes, with striking use of light and colour, without any formal training. In 1949 the English woman Florence Rutter heard about the children and came to visit the settlement. Impressed by the children’s original designs, she bought them and went on to promote and exhibit the works in Europe and the USA, gaining global recognition. The drawings form an important contribution to Noongar history and to Aboriginal art history. The scenes of hunting, corroborees and the environment illustrate some of the last remaining memories of traditional cultural activities in the south-west. Young Noongar artists such as Revel Cooper, Reynold Hart, Mervyn Hill, Parnell Dempster, Claude Kelly, Micky Jackson and Barry Loo developed a unique style of expression and had a major influence on later generations of Aboriginal artists.